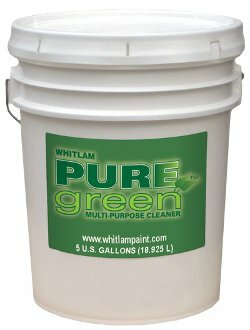 Concentrated PURE-green All Purpose Cleaner is biodegradable, contains low VOCs and is a safe alternative to toxic cleaners, solvents, and bleaches. PURE-green removes; grease, oil, carbon, dirt, pet stains, coffee and juice stains, lipstick, adhesives, chocolate, and much more from any washable, indoor/outdoor household surface. PURE-green Multi-Purpose Cleaner is a concentrated cleaner for use in all types of sprayers and automatic floor scrubbing machines. Great paint remover for synthetic turf and for cleaning bleachers, dirt from sythetic turf, seats and concrete or asphalt walkways. Excellent for use in striping machines as a general cleaner to remove old dried on paint. Recommended for use with the Port-A-Scrub Synthetic Turf Cleaning Machine and for removing TEMP-STRIPE Athletic Field Marking Paint.